Combine a UD MBA with a concentration in international business, and prepare to conduct business effectively in a global business environment. You will expand your business knowledge while building an international network of friends and colleagues. Many of our graduates are international students who return home with first-hand knowledge and skills in conducting business in two countries and a keen awareness of U.S. customs and traditions. Other graduates are U.S. citizens interested in global business and helping organizations to expand into overseas markets. As an international business student, you are encouraged to study abroad at the University of Delaware. Study abroad programs for graduate students are designed to fit into part-time student work schedules and are shorter than the 5-week or semester-long undergraduate experiences. In addition to the 9 prescribed credits of the concentration, you will choose an additional 6 credits of electives. Learn more about MBA admissions requirements, deadlines, tuition and financial aid available to you. 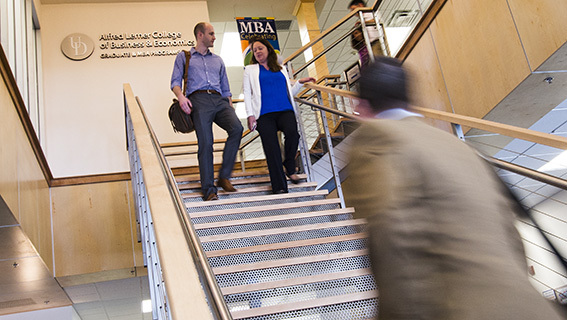 Meet with our admissions team during one of our MBA Walk-In Wednesdays. May 1 from 4-7 p.m.
May 8 from 4-7 p.m.
May 15 from 4-7 p.m.